If I had to make a list of things I could eat forever and never get sick of, hummus would be at the top. It's a staple side to everything I make weekly from Meal Prep Workbook, and truthfully I sometimes just snack on it with a spoon. This is an update to the hummus recipe I used to have on my website. 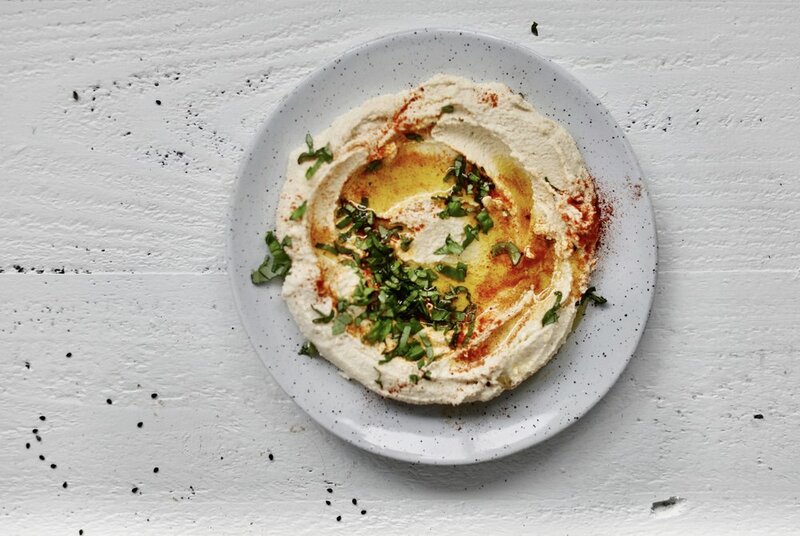 I've picked up a few tricks from pouring over the recipes and methods of famous hummus spots like Tusk in Portland and Dizengoff in Philadelphia. I strayed from traditional hummus for a while after I inadvertently gave myself a sensitivity to lemon living in California where the citrus trees were abundant. Long story short, what you're eating at a given time dictates what your immune system reacts to. In my case I was eating way too many lemons, so I guess I took the ELISA test at just the right time to slow myself down. So while I needed to lay off the lemon for another few months before trying to reincorporate, I substituted apple cider vinegar for the traditional lemon used in hummus. If you can tolerate lemon, by all means use it in equal proportions. If you're trying it with ACV, you might have to counter the hint of sweetness with garlic salt. Otherwise, plain celtic sea salt will do. The addition of sprouted garbanzo beans makes an enormous difference in this hummus compared to store-bought. Not only is the proper preparation of legumes critical to your digestion (trust me, you will notice a difference), it makes the nutrient bioavailability greater. Don't have garbanzo beans on hand? Sprouted black beans make an incredible hummus. If you're not sprouting your own nuts, grains, and seeds, I highly recommend Blue Mountain Organics. Cook the sprouted garbanzo beans with baking soda, refer to this guide on preparing your own dried beans. For dried garbanzo beans, I usually cook for 45 minutes on a medium flame and let sit covered for 2 hours before making the hummus. Add all ingredients (only 1/2 cup of water to start) to a food processor, blending until completely smooth. Add additional reserved water if the hummus is too thick for your liking. Serve plain or add toppings like olive oil, paprika, sumac, or fresh green herbs. This hummus goes great with leftover nut pulp crackers, in a baked sweet potato, or on roasted vegetables and meats. Store refrigerated in a sealed glass container.